"Just beyond the horizon Aapep lies coiled in wait, greedily charting Ra progress across the heavens. 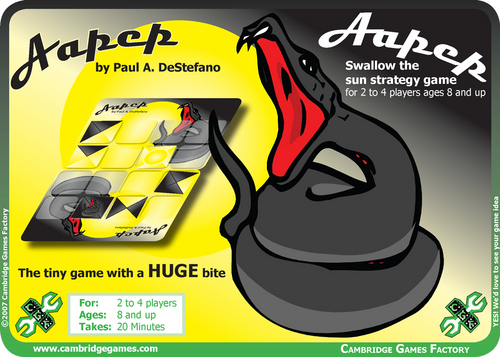 At dusk, as the setting sun brushes the western mountains, he prepares to strike..."
In Aapep you play either the demon Aapep , trying to swallow the sun, or the god Ra , fighting to escape the dark seas of the underworld. Players take turns placing pyramid tiles onto the board -- Aapep swallows the sun if from any edge of the board he can see dark sides on the first pyramid tile that is visible from that direction while Ra escapes if from any edge of the board he can see light sides on the first pyramid tile visible from that direction. Once all tiles are placed, players move a pyramid on their turn -- making for some tough strategy for an apparently simple game on a tiny (4 x 4) board. pure,distilled strategic fun for 2-4 players ,..amazing!